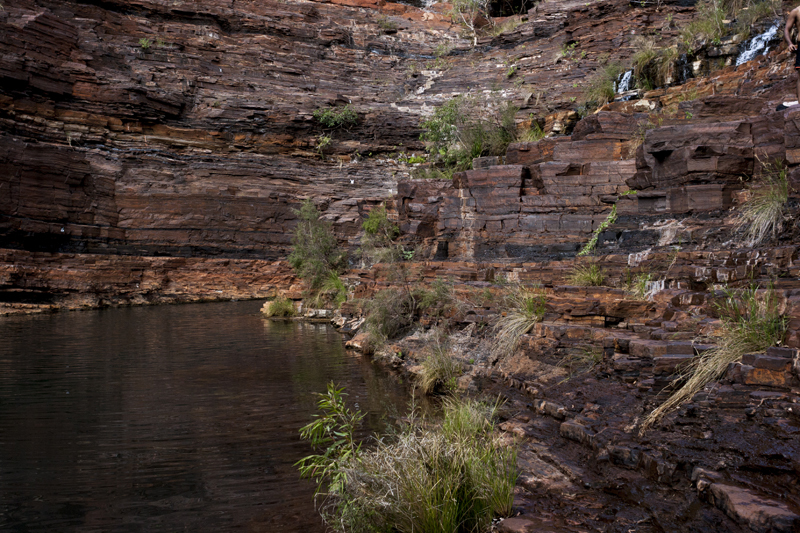 Following an impressive hike of Mount Bruce, second tallest peak in Western Australia, the following day was spent down in the gorges in Karijini National Park, the second largest national park in Western Australia. 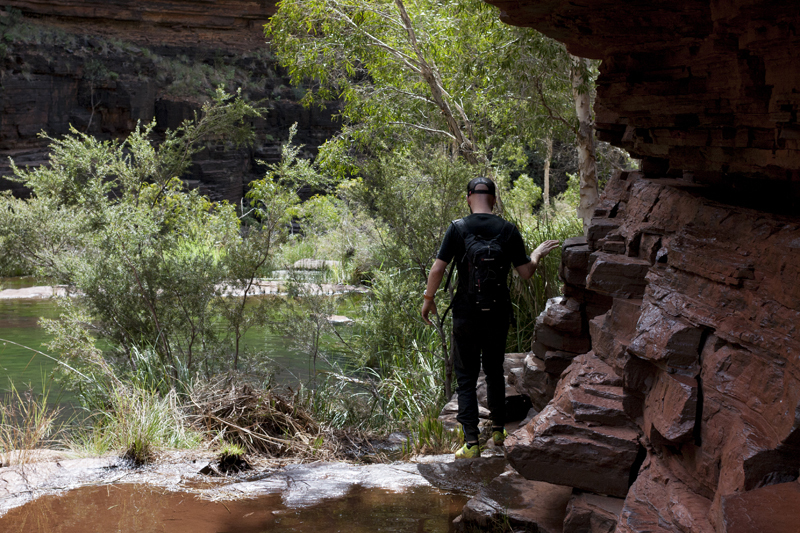 Unmarked by industry and a horizon of ancient landscape made up of stunning colours, we consider Karijini to be a special escape because you will definitely connect with the wonders of nature. Treating ourselves to a sleep in, our morning start was a relaxed and slow one by the time we arrive at Fortescue Falls car park, one of two entries into Dales Gorge. We descend a long staircase into the gorge, passing up close to its exposed walls and a number of trees. Being Easter long weekend we’re exploring the area with a fair amount of people, well, by West Australian standards where its typically not unusual to find space to yourself. I love Western Australia for that! This particular walk is a class 4, it’ll entail uneven walking surfaces with natural obstacles and some steep stepping. Markers like the one below will help us navigate from one end of the gorge to the other, making the walk fairly straight forward. 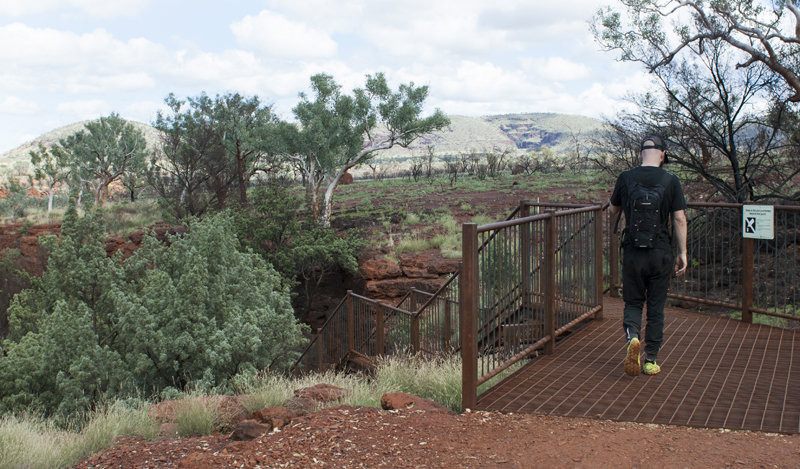 The staircase ends on ancient rock and we veer left, down uneven rock steps shaped over time, along side a permanent water pool and the flowing Fortescue Falls. 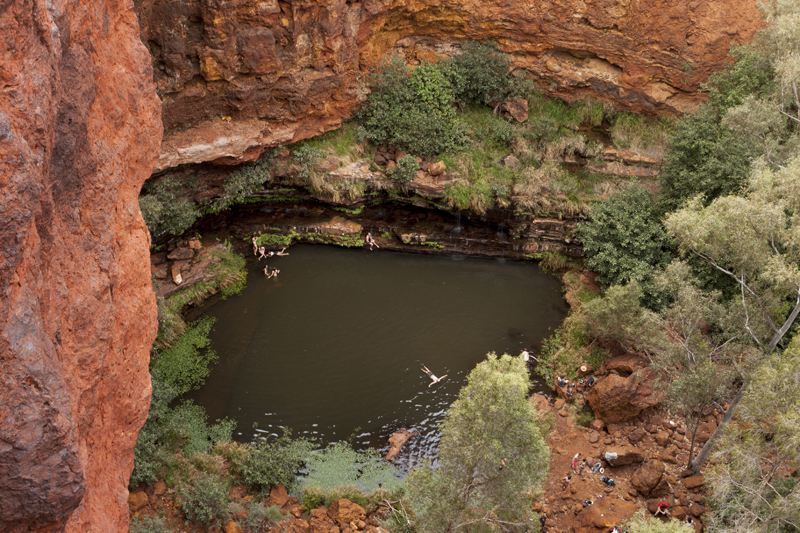 It’s tempting to begin the day with a swim at Fortescue Falls, however we decide to complete the walk to Circular Pool first and return for a swim later. 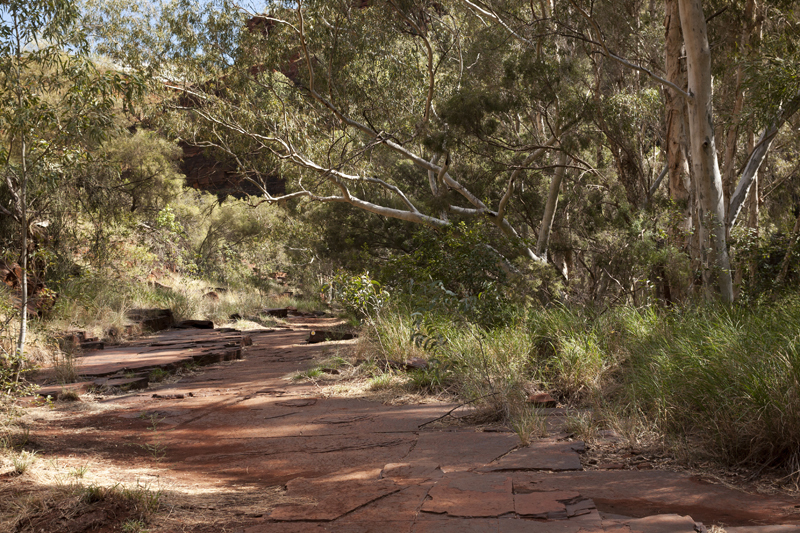 The walk in the gorge is around 2 km return. The fun begins as we navigate stepping stones, avoiding our feet dipping into the small amount of water. 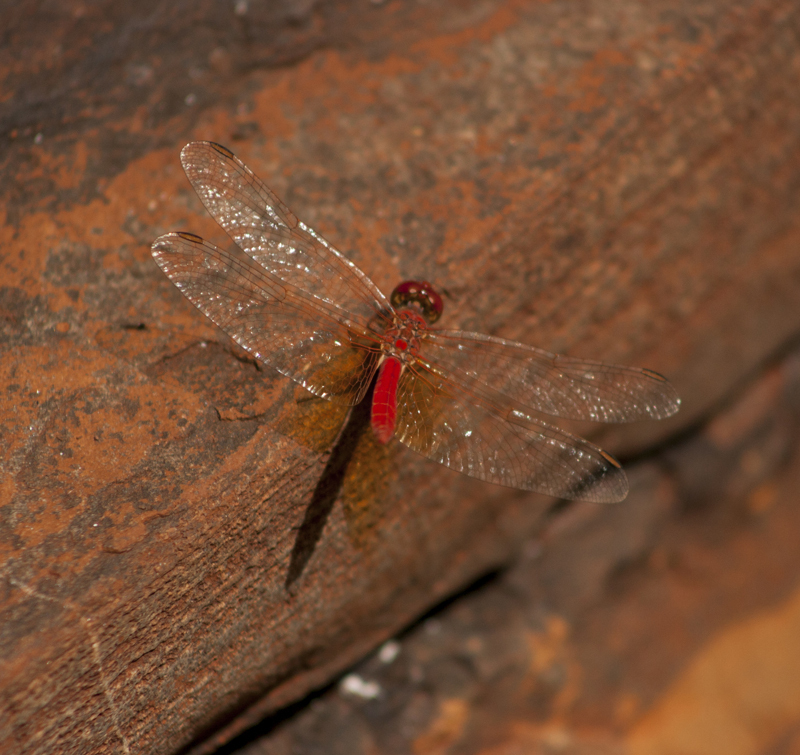 Dragonflies skim the water and I momentarily capture this one on the rusty coloured rock, the light catching it’s glass wings beautifully. 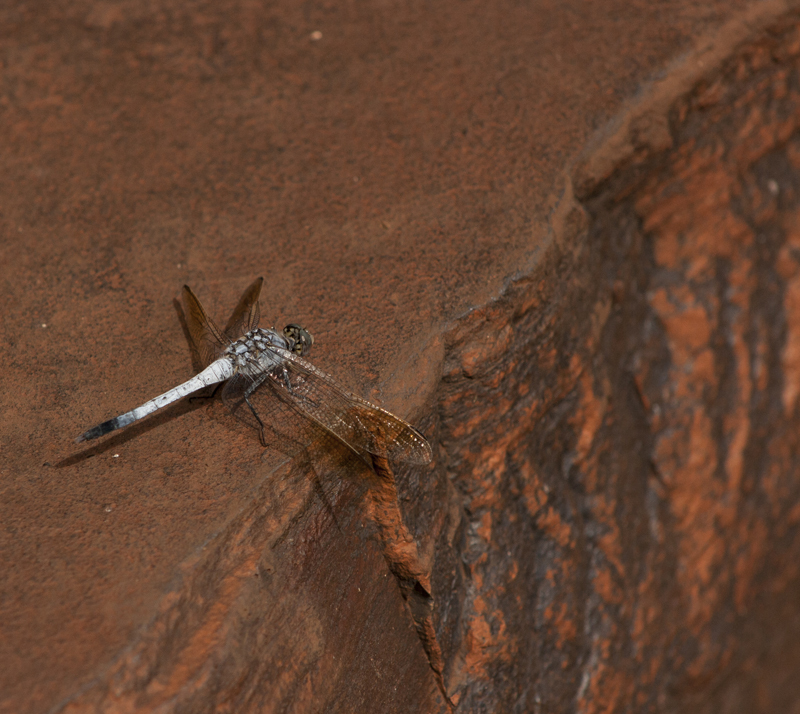 The sounds of insects is the norm in the Pilbara, for us, its an incredible noise. 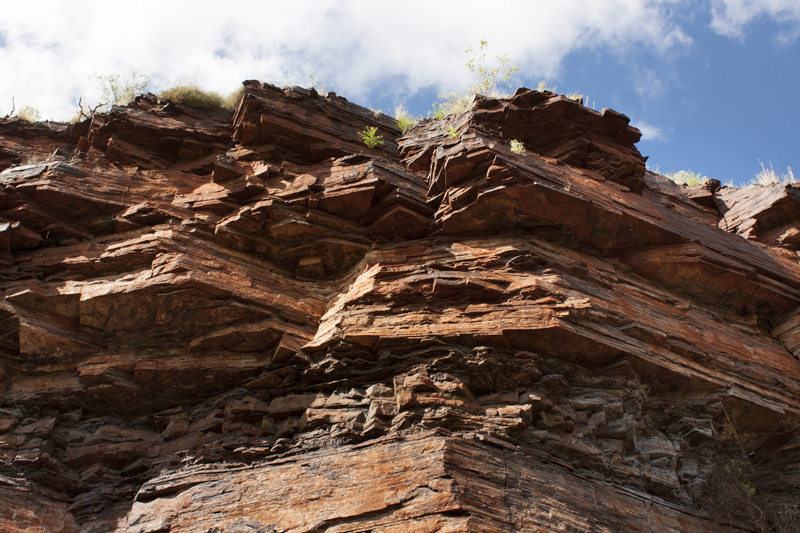 On our first week driving along the highway in the Pilbara, we found ourselves pulled over to the side of the road just to listen to the collective noise. I feel that there are more insects than cars…. On the gorge floor we look up to the jagged tiled cliff top. Each layer features a different colour and shape, just like a layered cake. 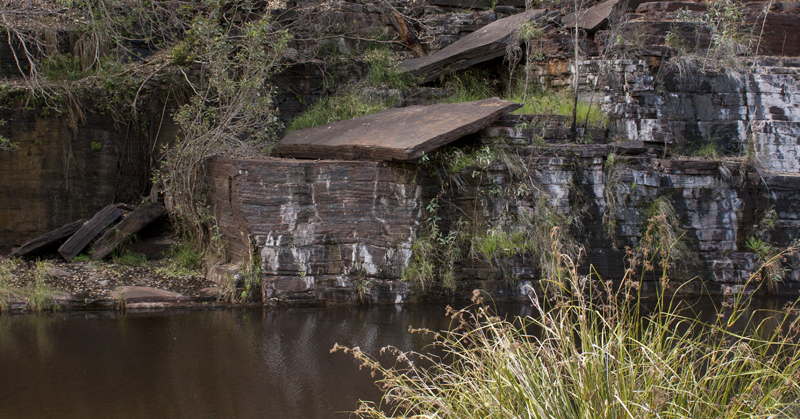 We use stepping stones and the support of the gorge wall for balance as we make our way to Circular Pool. The whole activity is like being a kid all over again, don’t fall in the molten lava! We pass a charred black section of wall, remnants of a past fire. Sounds of water running begin to stir louder as we approach the corner of the gorge wall, streaming water cascading over rock comes into view. 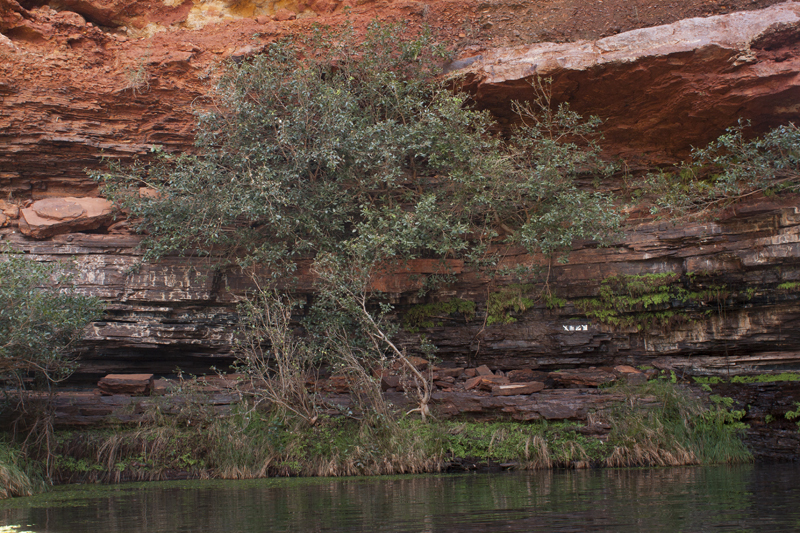 The Fortescue River catchment runs through part of Karijini National Park and its interesting to find out, much of it flows underground. The crisp cool morning turns into a pleasant and windless warm day of 30 degrees. It’s a perfect day for a swim. We cross to the other side of the gorge using stepping stones over a trickling section of water. 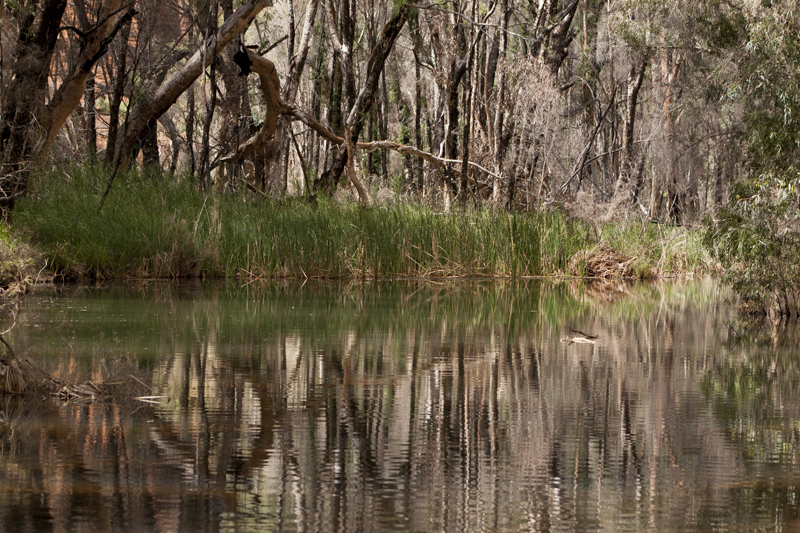 To the right we see a lovely pool lined with paperbark trees. Wandering around in this magnificent landscape, we find ourselves pausing to observe the smaller details like the layers in random rocks. 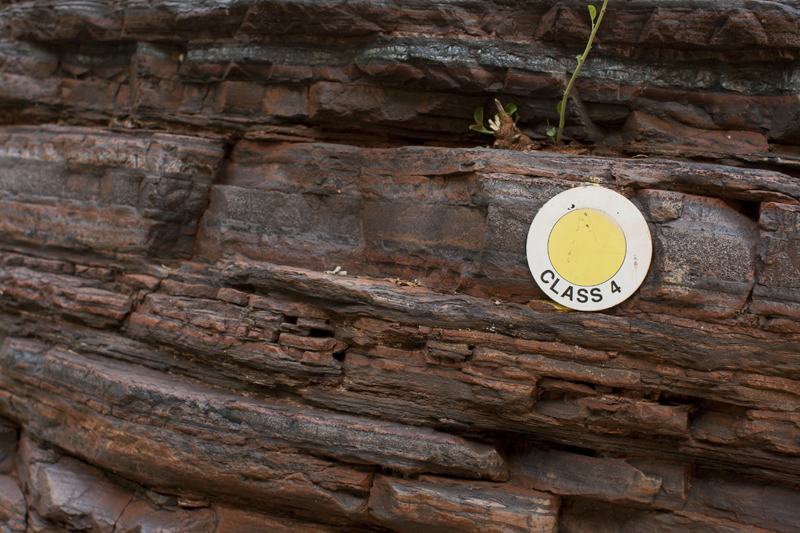 The gorge holds some wonderfully stunning exposed layers of iron ore banded deposits. 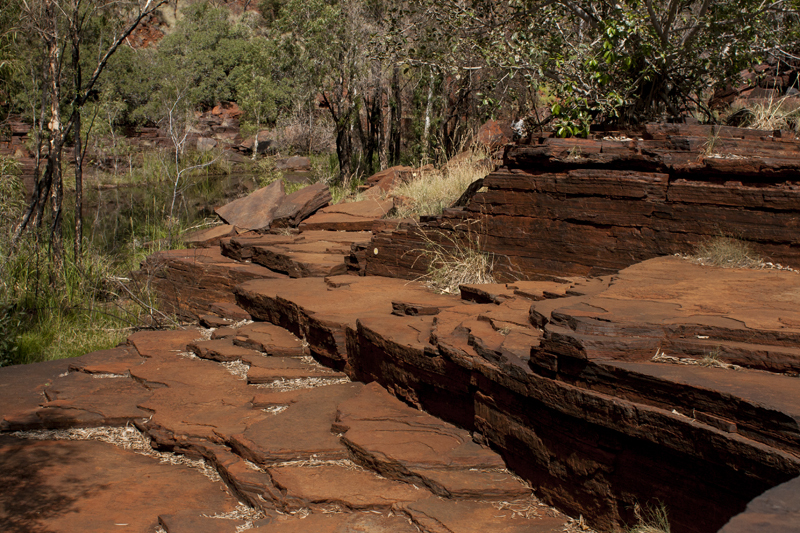 While the gorge floor is mostly a series of uneven rock steps, soon enough we come across a flat dry section. Perhaps waiting for some rain to come through. 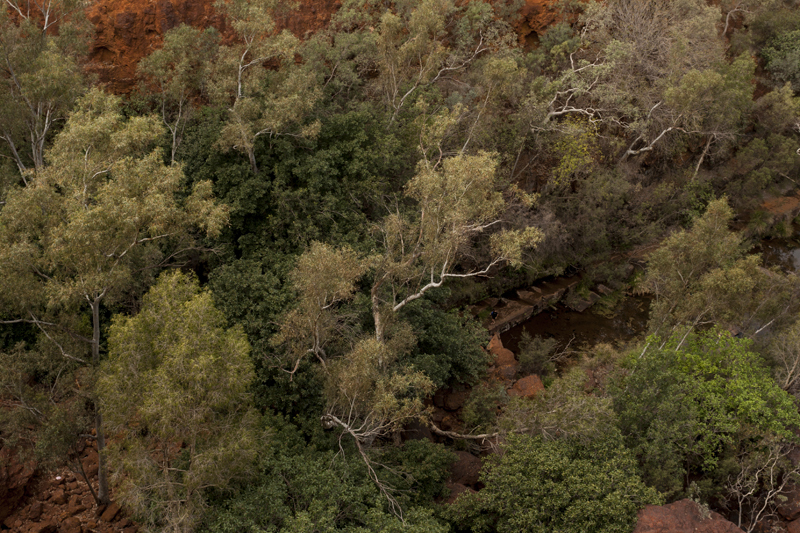 The Pilbara landscape brings three colours together beautifully – rust red, blue and green. Large rock like tiles rise up from the floor as we make our way to the promise of a swim and cool off. 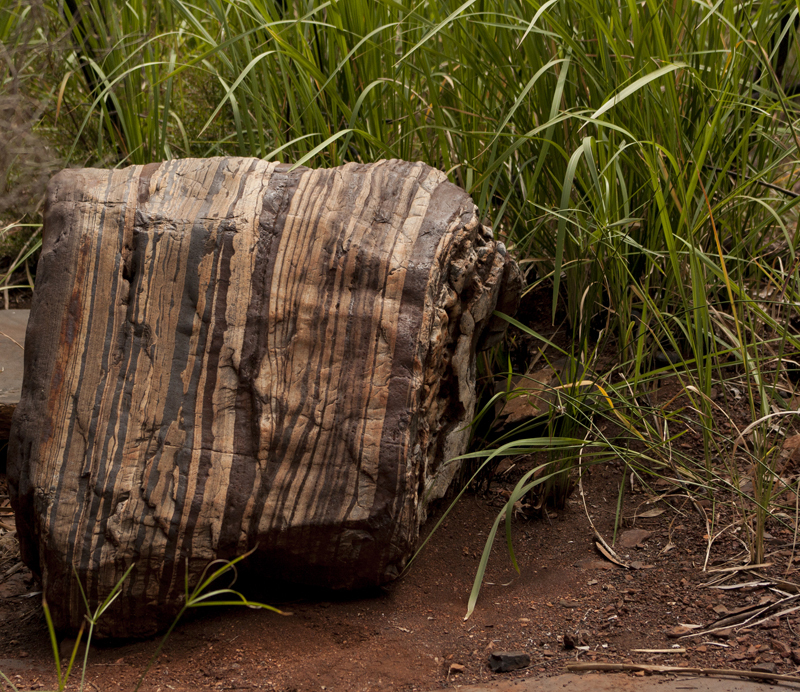 Time and weather has shaped some interesting rock forms of boulders, vertical slabs and chiselled layers. 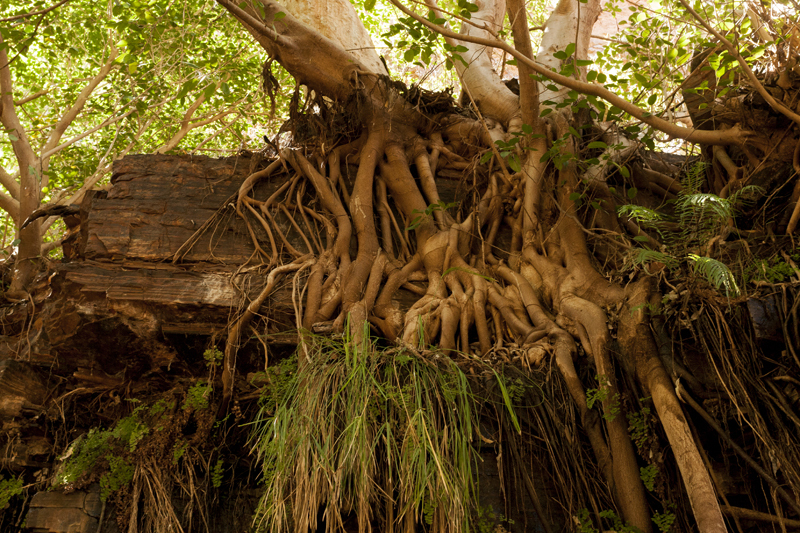 We cross a stream and walk along a tiled rock terrace under the shade of some beautiful large fig trees. 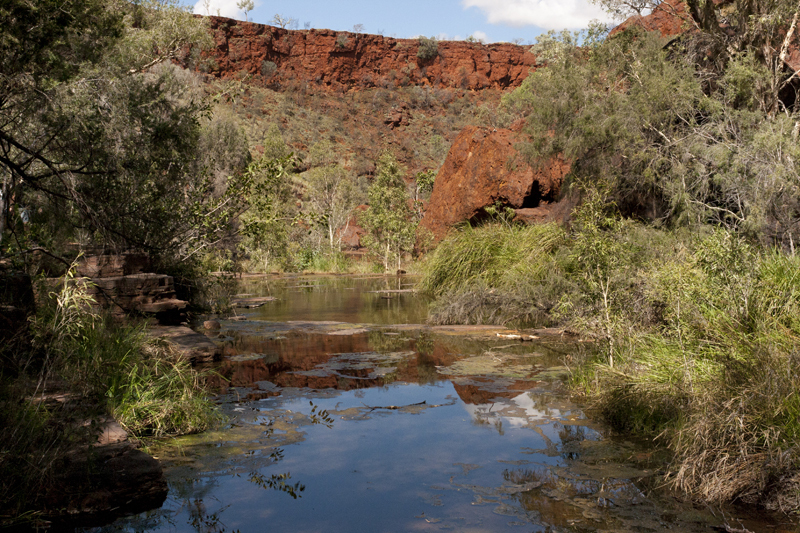 Water sounds and laughter echoe through the gorge, we’re close to Circular Pool. 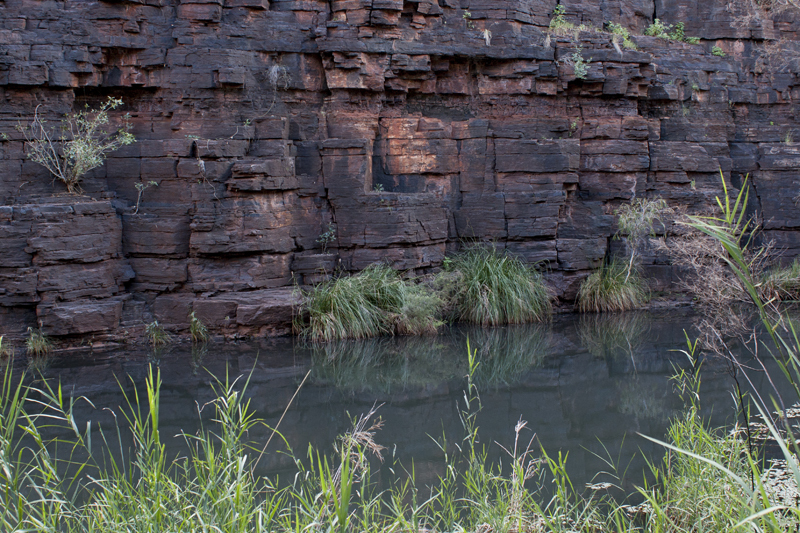 A natural amphitheatre surrounds the deep clear waters of Circular Pool. The popular spot is teeming with people in and out of the water. I dare say the Warlu is not impressed with some. Despite the absence of tranquillity this morning, we find a lovely spot under the shade of a fig tree next to an unfazed reptile. We dig out our sushi rolls from the backpacks for lunch before slipping into the chilled clear waters of circular pool. For the return there are two options. 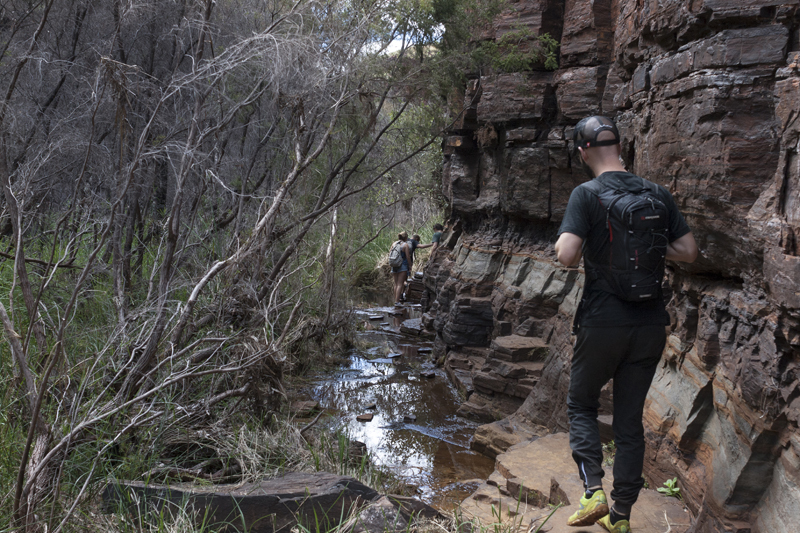 Take a path up and out of the gorge, walking a trail that traces the rim of the gorge, or, return the same way to Fortescue Falls. Our first walk in the depths of a gorge, the decision comes easy, we are keen to experience it all over again, so we take the same path back in wet bathers. 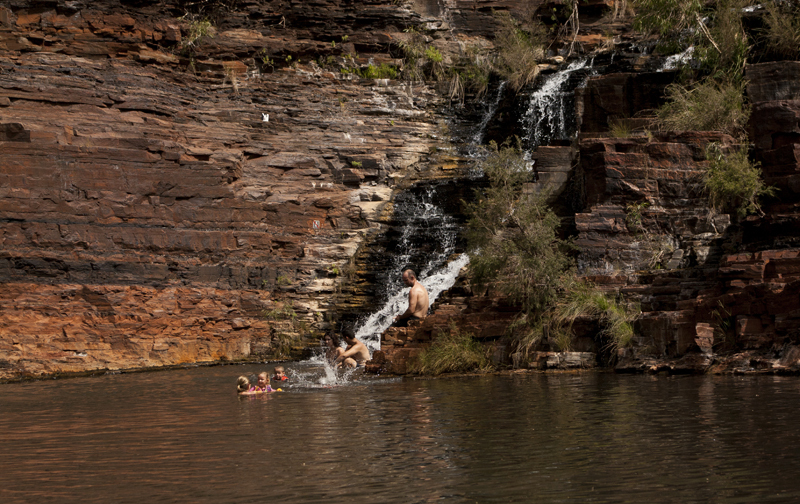 We stop by Fortescue Falls for another swim. 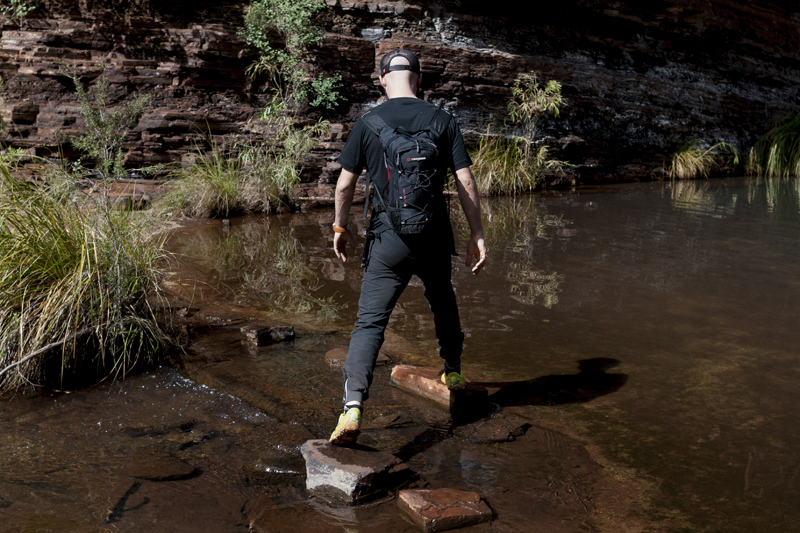 During our time at Karijini National Park we experience some firsts. Walking a gorge and swimming up to a waterfall are two experiences ticked today. In a nutshell, our morning in the depths of Dales Gorge entailed some fun hiking, beautiful scenery and a swim in chilled crystal clear waters. 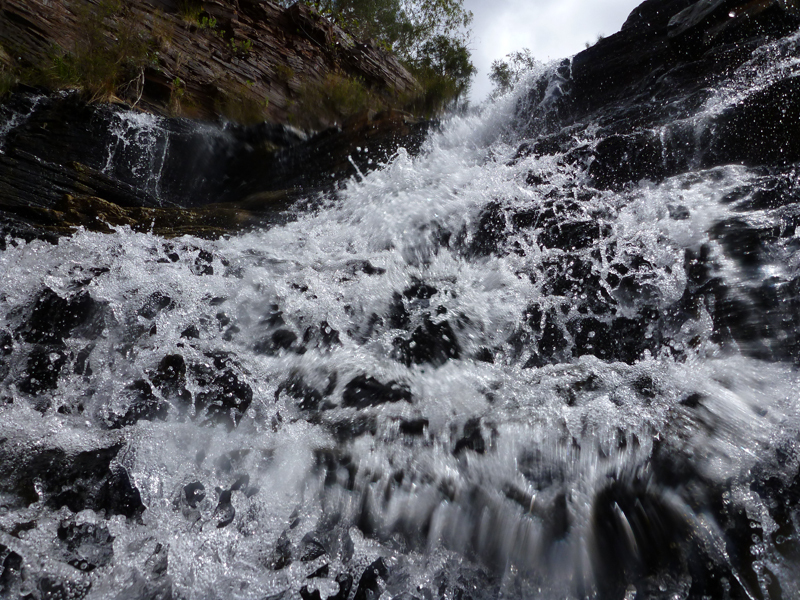 While walking the gorges it should be said, there is a risk for mishap which lies largely dependant on your own actions. The water is deep in the pools and the rocks can be slippery when wet. 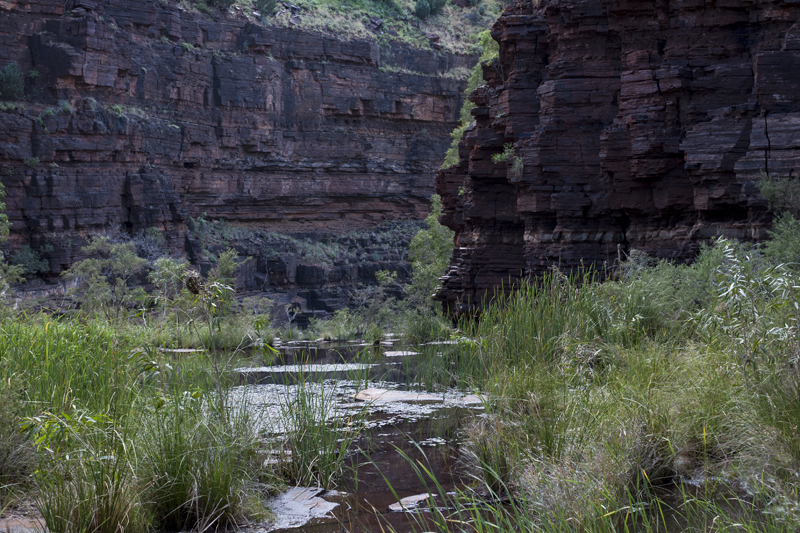 The beauty of the gorges can easily distract you from staying well hydrated and energised – be sure to drink water and bring along snacks for energy. But don’t forget to take all rubbish with you on the way out. Leave no trace.